By default, Mac OS Terminal bash profiles remembers 500 lines of command history in shell. While 500 lines is a lot, some prefer to remember more lines of history to repeat commands. Follow the steps below to increase the HISTFILESIZE setting inside your Terminal bash profile. A number will be displayed which will be the number of lines of commands your current bash shell is remembering. Next, type “i" to insert into the file. 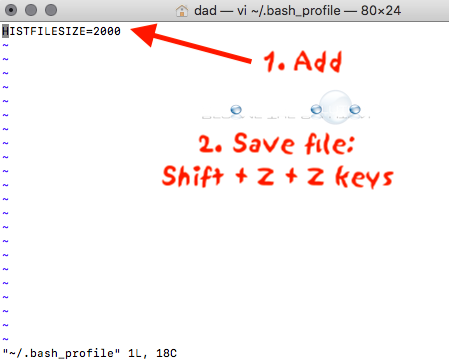 Finally, type Shift + Z + Z (that’s shift key and Z key twice) to save and write out the .bash profile file. You will need to restart Terminal for the changes to take affect. You can issue the echo $HISTFILESIZE command to see the updated lines of command history saved now.